Legal basis is the Trademark Act of June 10th, 1983, in force since October 1st, 1983. Monaco is a member of the Madrid Agreement and the Madrid Protocol. Trademark protection is obtained by registration. It can also be acquired by use, if this use has allowed the trademark to become well-known. Registrable as a trademark are all distinctive and graphically representable signs, such as words, names, acronyms, letters, numbers, devices, colours, three-dimensional forms, the three-dimensional form of a good or its packaging and any combination of the mentioned signs. Sound marks and olfactory marks are not registrable. The following trademark types are registrable: trade marks, service marks, collective marks, certification marks, titles of establishment and trade names. The application is filed at the Patent Office. The application must be in French. Foreign applicants do not need a local agent. Trademark application must be filed in person by the applicant or a representative. The designation of a common local agent is compulsory for trademark with co-owners. A non-legalised power of attorney in French is sufficient. The Office needs the corresponding original version. In the negative, an objection will be raised with an 8 calendar days deadline to submit the document. The application process includes a formal examination and an examination of distinctiveness. The trademark office does not check the prior marks. The timing to obtain registration is maximum 3 months. After registration, the trademark is published black and white in an annex of the quarterly “Journal de Monaco” Intellectual Property Section. There is no use requirement in Monaco. There is no opposition procedure at the registry. A court action is required to cancel a mark. There are no use requirements. The official fee for filing a trademark application is EUR 63.00 for up to three classes and EUR 18.00 for each additional class. There are no registration and publication supplemental fees. INLEX MONACO Intellectual Property is an Intellectual Property law firm member of the group INLEX IP Expertise, created with 2 Monegasque associates in 2006, specialized in the validation, protection, defense and valorization of projects for the creation of trademarks, designs, copyrights and commercial and marketing concepts. The firm is currently commissioned by major companies installed in Monaco, but also performs advisory work for the Government of Monaco, concerning its intangible heritage protection policy and the harmonization of its legislation with European standards. 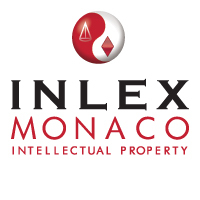 In synergy with the group, INLEX Monaco Intellectual Property provides its clients with a high level of expertise in export development strategy. Intellectual Property creates value for businesses, particularly in light of the booming economy of the immaterial and the dissemination of information. INLEX IP Expertise Group employs 65 people present in Monaco and Europe - France (9 agencies) and Africa (3 agencies: Morocco, Cameroon & Mauritius).